Ray Liotta is an American actor, best known for his portrayal of Henry Hill in the crime-drama Goodfellas, directed by Martin Scorsese and his role as Shoeless Joe Jackson in Field of Dreams. He has won an Emmy Award and been nominated for a Golden Globe Award. He was born in Newark, New Jersey, and was adopted at the age of six months by Mary Liotta, an appointed township clerk, and Alfred Liotta, an auto parts store owner, personnel director, and the president of a local Democratic club. Both of his parents unsuccessfully ran for local office. Liotta had believed his biological parents were of Scottish and Italian descent, but eventually reunited with his biological mother and discovered that she is not of Italian descent. In 1973, Liotta graduated from Union High School in Union, New Jersey, and was inducted into the school's Hall of Fame in 1992. Liotta studied acting at the University of Miami, where he performed at the university's Jerry Herman Ring Theatre. One of Liotta's earliest roles was as Joey Perrini on the soap opera Another World. He appeared on the show from 1978 to 1981. He infamously made his film debut sexually assaulting Pia Zadora with a garden hose in the cult classic The Lonely Lady. In 1987, he earned his first Golden Globe nomination for his portrayal of volatile ex-con Ray Sinclair in Jonathan Demme's film Something Wild . In 1989, he costarred, along with Kevin Costner, in the fantasy/drama film, Field of Dreams. Liotta portrayed Shoeless Joe Jackson, the ghost of the famed baseball player. In 1990, Liotta portrayed real-life mobster Henry Hill in Martin Scorsese's film Goodfellas. The film was nominated for six Academy Awards, including Best Picture. Liotta would earn more critical praise for his turn in James Mangold's film Cop Land, starring alongside Sylvester Stallone, Robert De Niro and Harvey Keitel. In addition to his film roles, Liotta portrayed legendary singer Frank Sinatra in the 1998 TV movie The Rat Pack and provided the voice of Tommy Vercetti for the 2002 video game Grand Theft Auto: Vice City. That same year he appeared as Det. Lt. Henry Oak in the Joe Carnahan-directed film Narc, receiving an Independent Spirit Award nomination and a Phoenix Film Critics Society Awards nomination for Best Supporting Male,a praised performance that many critics concidered to be Liottas careerbest.He then reunited with directorJames Mangold in 2003 alongside John Cusack and Alfred Molina in the dark horror-thriller Identity,remembered for its very unique and clever twist. He also narrated Inside the Mafia for the National Geographic Channel in 2005. Liotta had a memorable guest appearance that year on the television drama ER playing Charlie Metcalf in the episode "Time of Death". The role earned him an Emmy for "Outstanding Guest Actor in a Drama Series". 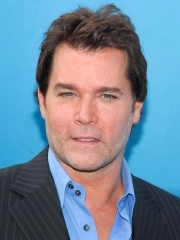 Liotta would later spoof himself and his Emmy win in Bee Movie. He starred in the 2006 CBS television series Smith, which was pulled from the schedule after only three episodes had aired. He later appeared in Smokin' Aces , portraying an FBI agent named Donald Carruthers in one of the lead roles. He appeared with John Travolta in the movie Wild Hogs and with Johnny Depp in the 2001 film Blow, portraying the father of drug dealer George Jung. Liotta has appeared in Battle in Seattle as the city's mayor, and in Hero Wanted playing a detective alongside Cuba Gooding Jr.. He was also in Crossing Over, co-starring Harrison Ford. Liotta played Detective Harrison in the 2009 Jody Hill comedy Observe and Report as Seth Rogen's nemesis from the local police. In 2011, he starred in The Son of No One, opposite Channing Tatum and for the first time in his career, Al Pacino. He told ABC's Good Morning America in 2001 that he was offered the role of Tony Soprano by series creator David Chase but turned it down to focus on movies. Liotta's recent movies include Date Night with Steve Carell, Charlie St. Cloud with Zac Efron, the independent drama Snowmen, and The River Sorrow, which stars Liotta as a detective alongside Christian Slater and Ving Rhames. Liotta married actress Michelle Grace in February 1997. They met at her ex-husband's baseball game; they also co-starred in The Rat Pack, in which Liotta played Frank Sinatra and Grace played Judith Campbell Exner. Their daughter, Karsen, was born in December 1998. The couple divorced in 2004. Liotta currently resides in Pacific Palisades, California. A baseball pitcher bearing his name is currently in the Kansas City Royals system. As part of his contract for starring in In the Name of the King: A Dungeon Siege Tale as Gallian, Liotta had permission to keep all wizard robes donned for the film. On February 17, 2007, Liotta was arrested in the Highlands of Pacific Palisades after crashing his Cadillac Escalade into two parked cars on Palisades Drive, approximately half a mile from his residence. He was charged with a misdemeanor DUI. Liotta was released on $15,000 bail and a court date was set for March 2007. Liotta was alone in his car, and no one was injured in the crash. Whole or part of the information contained in this card come from the Wikipedia article "Ray Liotta", licensed under CC-BY-SA full list of contributors here.